Sunita Narain has been with the Centre for Science and Environment (CSE) since 1982. She is currently the director general of the Centre and the treasurer of the Society for Environmental Communications and editor of the fortnightly magazine, Down To Earth. She is a writer and environmentalist, who uses knowledge for change. In 2005 she was awarded the Padma Shri by the Indian government. She has also received the World Water Prize for work on rainwater harvesting and for its policy influence in building paradigms for community based water management. In 2005, she also chaired the Tiger Task Force at the direction of the Prime Minister, to evolve an action plan for conservation in the country after the loss of tigers in Sariska. She advocated solutions to build a coexistence agenda with local communities so that benefits of conservation could be shared and the future secured. Narain was a member of the Prime Minister's Council for Climate Change as well as the National Ganga River Basin Authority. 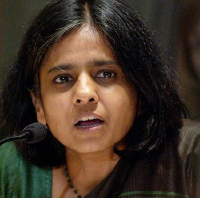 Narain began her work in the early 1980s, as a co-researcher with Anil Agarwal, an eminent and committed environmentalist who gave the country its environmental concern and message. In 1985, she co-edited the State of India's Environment report, which built an understanding in the country on why India is so important for the poor. With Anil Agarwal she learnt that environment and development are two sides of the same coin and that for the millions of poor, who live on the margins of subsistence, it a matter of survival. In 1989, learning from the successful initiatives of people to manage their environment, Anil Agarwal and she wrote Towards Green Villages advocating local participatory democracy as the key to sustainable development. She has continued to research and write about how environment must become the basis of livelihood security of people in the country. She has also linked issues of local democracy with global democracy, arguing that every human being has an entitlement to the global atmospheric common. In 2012, she has authored the 7th State of India's Environment Reports, Excreta Matters, which presents a comprehensive analysis of urban India's water and pollution challenges. She has devoted time to build the capacities of the CSE so that it can function as an independent and credible institution, influencing public opinion and advocating change. Today, with over 120 full time staff, it is actively engaged in a variety of programmes spanning issues of water management, to rating of industries in terms of the environmental performance and training. CSE is an institution, which believes in the need to use knowledge to bring about change. In other words, it is about "working India's vibrant democracy". The challenge for CSE is to raise concerns and to participate in seeking answers and more importantly, in advocating for the answers to become policy and then practice. Air pollution is an extremely serious problem, which damages the respiratory system and can lead to mortality as well. Narain, working with her colleagues at CSE, has been actively engaged in advocating for air pollution control. She believes that the answers to the growing problems of pollution will be in reinventing the growth model of the Western world so that we can leapfrog technology choices and find new ways of building wealth, which will not cost us the earth. It is in this context that Narain and her colleagues advocated for the introduction of Compressed Natural Gas (CNG) in Delhi, to reduce air pollution. The successful implementation of CNG in buses in the capital has lead to substantial reduction in air contaminants and has become a model for the rest of the world. As a member of the statutory body, set up under the Environment Protection Act and under mandate from the Supreme Court, the Environment Pollution (Prevention and Control) Authority for the National Capital Region, she continues to monitor and implement strategies for reducing pollution in Delhi and in other cities across the country. Water is clearly most important asset for the country. For Sunita Narain it is an issue of great passion as she devotes time to research and advocate for the need to change the paradigm of water management in the country. She began work in this area with her colleague, Anil Agarwal, as she discovered the fascinating ingenuity of communities to harvest rainwater across the country. Research lead to their book, Dying Wisdom and then later a book entitled, Making Water Everybody's Business. Since then she has continued to build an understanding of the need for water security, using rainwater harvesting to augment resources and pollution control to minimise waste. She believes that her biggest contribution would be to build a strong and vibrant movement for water literacy in the country. In 2005, the Centre and she were awarded the Stockholm Water Prize, considered the Water Nobel for work on building an informed public opinion on the need for decentralised water management and rainwater harvesting. In 2012 she published a comprehensive report on the state of urban water supply, sewage management and pollution. This report has provided impetus for policies on these issues. It is in this context that Narain has argued that the National Rural Employment Guarantee Programme public funds to create public assets with the labour of poor people. And the opportunity lies in using such labour to build assets: drought relief for relief against drought. Today, the national rural employment programme is already the world's biggest ecological regeneration effort - just under a million water bodies being dug, desilted or renovated by people. Now we must make sure these water bodies are not just holes in the ground, but will capture the next rain and recharge the aquifer. Her work to build awareness on this issue continues. In 2001, CSE set up a state of art laboratory to analyse contaminants in water and food so that it could undertake science for ecological security. In 2003 and 2004, under Narain's direction, the Centre analysed bottled water and then carbonated beverages for pesticide content. The aim of the study was to understand the extent of contamination of our groundwater and food systems and to use this research for reform. The study lead to the setting up the Joint Parliamentary Committee (JPC) on pesticide residues in and safety standards for soft drinks, fruit juices and other beverages. The JPC gave its report in February 2004, endorsing the findings of CSE on pesticides in carbonated beverages and recommending wide ranging reform in food safety for the country. The report of the parliamentarians has become an important milestone in building a new and more vibrant regulatory system to ensure that contamination in food and water is minimised and does not compromise human health. Narain's research has also helped to build a strong public opinion in favour of reform, particularly, regarding the contamination of groundwater, the drinking water source of millions of people across the country. Narain began work on climate change in the early 1990. In 1991, she co-authored Global warming in an unequal world: A case of environmental colonialism, which played a critical role in establishing the principle of equity in the framework convention on climate change. Since then she has continued to work in building awareness and consensus about the need for an effective and equitable climate change agreement. She has researched and authored publications on different aspects of the climate regime - from aspects of negotiating positions to critiques of various trading mechanisms and options for mitigation and adaptation. In 2008-09, she served as a member of the Swedish government's high level commission on the need for adaptation and its links with development.